Best Buy is Upgrading Your Shopping Experience San Antonio! Hi guys! I want to share with you a new shopping experience launching at (3) local Best Buy locations in San Antonio. And for some fun, I have a FIVE $25 Best Buy gift card to giveaway to a FIVE lucky readers! Just leave a comment below with what you love to buy at Best Buy! I love buying tv's and smart phones! Maybe it's their great movie selection for you, let me know! Contest will end Tuesday 11/13 at 11:59 pm! Buena Suerte! 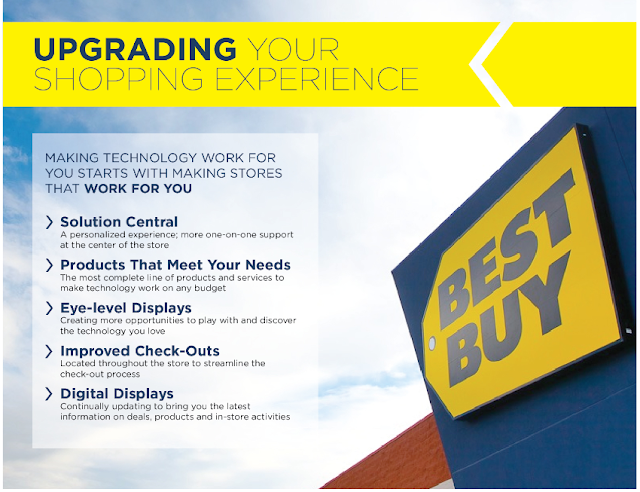 You can find out more about the new Best Buy here. And be on the look out for my shopping experience via Instagram and Twitter with the hashtag #NewBestBuy! Glad to hear the renovations are complete! I love Best Buy because of their great warranty service, honestly. Very willing to work with customers, I've been shopping there for years and so does my family. Cant wait to see the new layout at Best Buy. I've been a fan for many years! Item like TV's, Home Computers, Laptops, Movies, Headphones, Cables, Etc.. and let's not forget the Geek Squad, always ready to help! This is Bob Martinez. Not sure why Anonymous came out. I love the DS and Wii game selection. My kids have a lot of fun looking through the displays. What's not to love at Best Buy? I love the huge selection of electronics they have, My favorite section right now is the laptops one, maybe because I am in the search of a new one; The variety is great I don't have to go to a million places looking for the right one I know I'm gonna find it at Best Buy. Another thing I love getting there is the video games specially when they are on sale. best buy is an awesome place to check out phones and electronics. I go to buy movies there.